Good news to all SM Advantage Card (SMAC) members—to mark the second year partnership of Pilipinas Shell and SM Advantage, you can now redeem Shell fuel vouchers with SMAC points! 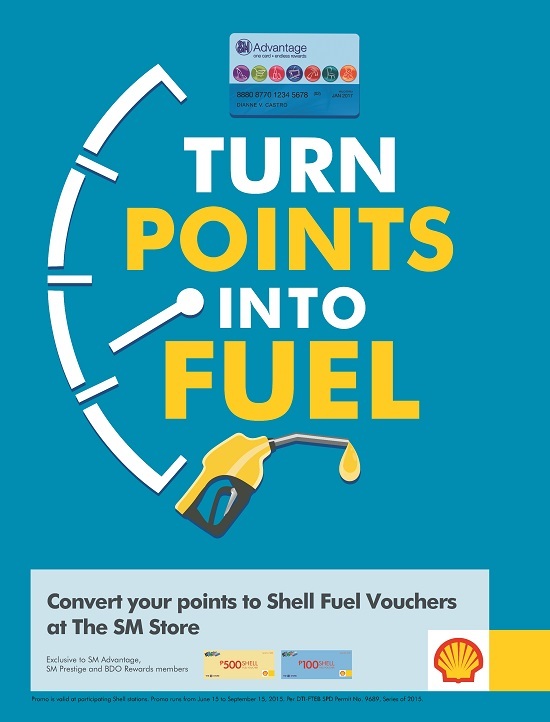 Beginning 15th of June until 15th of September this year, SMAC members can exchange a minimum of 100 points for Shell fuel vouchers at the Bills Payment Counter inside any branch of The SM Store. Vouchers are available in P100 and P500 denominations redeemable with 100 and 500 SMAC points, respectively. This limited-time offering is also extended to SM Prestige, BDO Rewards, and PRiMO members. Shell, the global leader in power, energy, and fuels technology, ensures that its customers are able to maximize the benefits of their loyalty. “It has always been our desire to make Filipino motorists feel that they are most rewarded at Shell, and with this latest venture, we hope that our customers will be truly delighted,” says Anthony Lawrence Yam, Vice-President for Retail at Pilipinas Shell. Through its partnership with SM Advantage, the country’s largest loyalty program, Pilipinas Shell entitles its customers to earn SMAC points every time they gas up at Shell stations. Consequently, earned points can be used to purchase various merchandise – fashion, food home, beauty, personal care, and many others – at SM retail brands and affiliates nationwide. But this time, SMAC points can also be converted to fuel vouchers which allow customers to be on-the-go. Whether you are getting ready for an out-of-town wedding with friends or making that one last errand to complete your child’s school requirements, a free Shell gas up would definitely be one of the best options to use your SMAC points on. “We then enjoin every SMAC member to take advantage of this offer to convert your hard-earned SMAC points to Shell fuel vouchers and experience Shell quality fuels in every drive,” Yam encourages.